Downers Grove, Illinois - Contemporary Controls continues to lead in the development of ARCNET and Ethernet communication products. With customer requirements as a focus, Contemporary Controls has designed the AI-SRVR that provides the ability to access an ARCNET network from an Ethernet network. 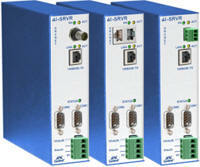 The AI-SRVR functions as an ARCNET server by executing communication requests from an Ethernet client. This device will receive ARCNET packets and send the data to Ethernet clients or reverse the process for transmitted packets. This product has power connectors similar to the AI Series of hubs. It can be powered from a wide range of low-voltage AC or DC power sources and provisions exist for redundant power connections. Models are available for coaxial bus, twisted-pair bus, and EIA-485 AC- or DC-coupled networks. VICTORIA, BC -- The SPACE-Sensor™ Temperature (SST) line of products has been recently released. The SSTs are attractive, executive-style sensors designed to complement SMART-Sensor™ LCD installations. Current research is examining the possibility of adding sensors for Humidity, Occupancy, and CO2 for release later this year. 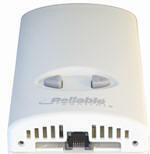 If you would like more information about Reliable Controls®, please visit http://www.reliablecontrols.com or email info@reliablecontrols.com. For more information on the SPACE-Sensor™ Temperature (SST) and the complete SMART-Sensor™ LCD (SSL) line, please see the interfaces section of our website (http://www.reliablecontrols.com/products/interfaces/). Distech Controls is proud to launch EC-Net, a web-enabled, multi-protocol solution powered by the Niagara Framework™. EC-Net establishes a fully Internet-enabled, distributed architecture for real-time access, automation and control of embedded devices and ties both new and legacy system components together; regardless of manufacturer, platform or protocol, into a common control system. Hubbell Building Automation's Simplicity LX Switch Station is designed for use in virtually any space and can be easily integrated into any LonWorks system. Available in 1 to 6 buttons, the soft contours of its architecturally pleasing design allow it to fit easily into any style interior. Each switch station features programmable button(s) with LED pilots. If required, switch stations can be programmed in an active or inactive state allowing the device to be automatically secured, eliminating the need for lockout key switches or locking covers. The Simplicity LX Switch Station complies with LonMark interoperability guidelines and is designed for use in open system, multi-vendor, interoperable LonWorks networks. Visit www.hubbell-automation.com for more information. In an ever-changing landscape of valve and valve accessories, simple and effective solutions are at a premium. 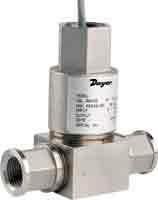 The NEW Series PV three-way normally closed electro-pneumatic solenoid pilot valves by Dwyer Instruments, Inc., are designed with these qualities in mind. When matched with the new Dwyer Series SAV Angle Seat Valves, supply pressure control is as easy as the flick of a switch. These low cost, durable pilot valves feature fully reversible DIN connections to keep electrical wiring hassle-free, while the direct mounting banjo connection eliminates common installation problems. Units are manufactured standard with a manual override, and have a wide variety of coil supply voltages available. 120VAC models will be stocked, with other voltages are available upon request. Visit http://www.dwyerinstruments.com/ for more information. SMC Corporation of America announces the release of series ASR/ASQ air saving valve. The Vaisala HUMICAP® Humidity and Temperature Transmitter Series HMT330 is developed for demanding industrial applications where stable measurement and wide customization possibilities are important. As a totally new feature in this product class, the HMT330 has a large numerical and graphical display with multilingual user interface. It allows the user to easily monitor measurement trends and 1-year history. Vaisala HUMICAP® products have been the market leaders in industrial and meteorological humidity measurements for over a decade. The new HMT330 series consists of six models covering the full humidity measurement range from 0 to 100 %RH. The temperature ranges are between –70 and +180 °C, and pressure ranges between 0 and 100 bar, depending on the model. In very humid or chemically harsh conditions, Vaisala's unique warmed probe and chemical purge features help to maintain measurement reliability. SIXNET announces its latest addition to their IPm product line of Linux-based RTUs and Controllers, the Micro-VersaTRAK µIPm. The µIPm (which stands for micro-IPm) is a rugged, compact unit with a built-in mix of 14 discrete & analog I/O, 4 serial ports and a 10/100 Ethernet interface. It is a sister product to the popular Mini-VersaTRAK mIPm (mini-IPm) which has up to 26 built-in I/O. Like other SIXNET IPm Controllers and RTUs, the µIPm is pre-loaded with open-source Linux and the industrial IPm firmware. This provides ready-to-use advanced automation, control, and data acquisition capabilities plus the flexibility to program your own Linux or IEC 61131 applications. Visit www.sixnetio.com for more information. WEST HARTFORD, Conn.– Wiremold/Legrand has introduced redesigned cover assemblies for Resource RFB® floor boxes, Walkercell® Cellular Raceway, and Walkerdeck® systems. New FloorPort™ service fittings feature a one-piece lid for easy access to power and data/communications. These covers are also now available in all-metal (die-cast zinc or die-cast aluminum) construction for high durability and load capacity. Brushed aluminum and plated brass finishes provide additional aesthetic options. FloorPort activation covers can be installed on carpet, tile/terrazzo, or wood covered floors. Flanged and flangeless styles are available in brass, aluminum, and painted black finishes to match almost any décor. WEST HARTFORD, Conn. – Wiremold/Legrand offers a family of floor boxes that are specifically designed to meet demanding convention center and similar applications. CCFB Series floor boxes provide multiple utilities, including power, data/communications, audio/video, water, and compressed air. The Dwyer Series 636D transmitters are constructed of welded 316 stainless steel with all 316L wetted materials, and designed to withstand the most demanding media and environmental conditions. This transmitter has a CSA explosion-proof rating which is ideal for sensing differential pressures of gases, liquids, and vapors in the specified hazardous locations. The Series 636D also conforms to NACE standards which is perfect for offshore applications. The Series 636D is available with a 4-20 mA current output (standard) or optional voltage output. Available differential pressure ranges include 0-6 to 0-500 psid and feature an excellent 0.5% full scale accuracy. Dwyer Instruments, Inc. produces a broad range of measuring and control instruments for pressure, temperature, level, flow, and many other related applications. Lascar Electronics has launched the EL-USB-1, the world’s first battery powered temperature data logger with a direct USB interface. Using the Windows compatible software supplied, the EL-USB-1 can be configured to measure temperatures from -25 to +80°C (-13 to +176°F). User selectable logging intervals from 10 seconds to 12 hours and a memory capacity of more than 16,000 readings make this data logger ideal for many temperature dependant industrial and consumer applications. The logger's housing provides a splashproof seal enabling the product to be used in harsh environments. The EL-USB-1 has user programmable high and low temperature alarms, which are shown locally by a bright red LED and can be set to remain active once an alarm level has been triggered. Additional green and amber LEDs inform the user of other logger conditions, including memory capacity and battery status. All readings are stored in non-volatile memory ensuring important data is never lost. 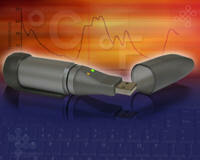 Simply plug the EL-USB-1 into a USB socket on a PC for instant download and graphing of logged data. Once the data has been downloaded, the logger can be instantly reconfigured to begin the next application. Halmstad, Sweden -- IntelliCom, is proud to announce a major software upgrade for the NetBiter® webSCADA Modbus Gateway. The product makes it possible to monitor Modbus data on web pages inside the Gateway. Connect Modbus devices and select data of your choice on the configuration web pages. Then you are able to view the configured data on the built-in web pages automatically without writing a single line HTML. - No Windows tools or HTML editors are required! - No licenses or royalties!